Many people are frightened when their optician tells them they have astigmatism. 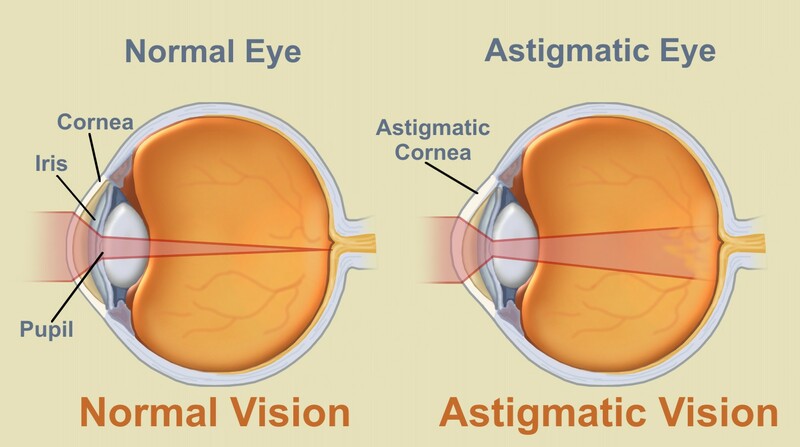 While astigmatism is a fairly common vision condition, people often do not know what it actually is. Astigmatism is one of the causes of blurry vision that occurs due to unequal curvature of the eye. Essentially, an eye with astigmatism is less perfectly round than one without it. An easy way to picture this condition is to imagine a baseball or basketball, both of which are perfectly round. Now picture an American football, which is egg-shaped. This egg shape is similar to an eye with astigmatism, except to a much lesser degree. In an eye without astigmatism, light passes through the cornea and focuses on a single point on the retina. However, due to the unequal curvature of the eye, an eye with astigmatism will have multiple focal points either in front of or behind the retina. This causes blurry vision. 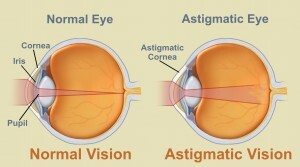 It is important to note that astigmatism can occur early on in a person’s life. Because of this, be sure to regularly schedule an eye exam for your children. The good news is that prescription lenses can remedy astigmatism, as well as other vision conditions. The opticians at GoSmartEyewear work to produce lenses that will address any or all correctable vision conditions you may have. As always, please contact GoSmartEyewear if you have any questions or concerns. This entry was posted in Conditions on September 18, 2014 by admin.